Sept 29th Street Competition Sign up starts at 10 AM contest starts at 11 AM. Mark your calendar! It’s here and we are ready! It’s our 4th year at the largest public skate park in the USA, North Houston Skate Park. 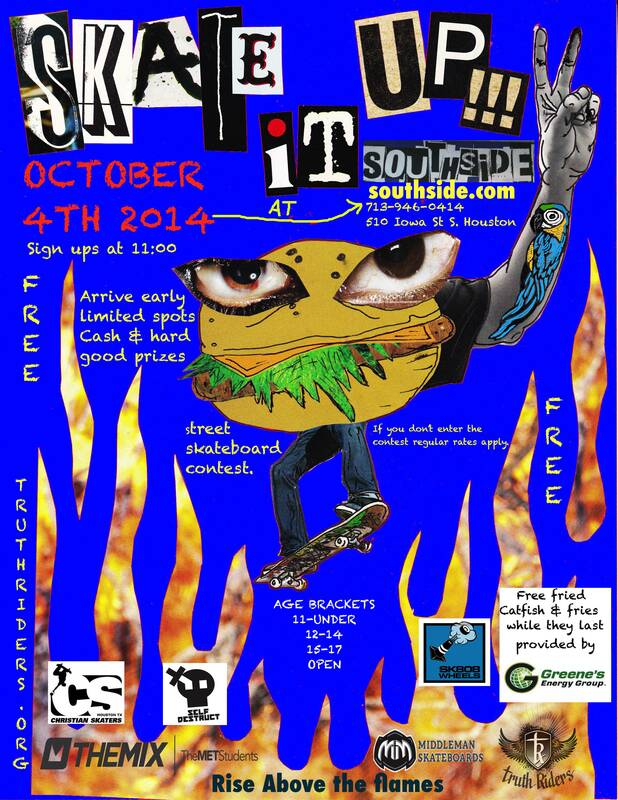 Professional skaters Brian Sumner, Judd Held, & Team Self Destruct are scheduled to be here to judge, and skate! The contest is FREE to enter and FREE to watch! All age brackets 1st 2nd and 3rd place winner will receive trophies. The format will be 5 skater jam for 2-3 minutes per jam. There will be a finals jam for each age bracket for the top 5 skaters of each age bracket. This year we have partnered up with Middleman Ministries. They have been a great help including a great way for everyone to get involved. Please read and join us in prayer for Pray it up for Skate it up 2018. Here the week-long daily prayers. Since January of this year, we’ve been blown away to see at least 26 kids, teenagers, and adults pray to receive Christ and begin their journeys as Jesus-followers. While the majority of the decisions we at Middleman walk people through are within one-on-one conversations and small group Bible studies, there is also great opportunity for God to draw people to Himself through events like Skate It Up 2018, which we are partnering with some great ministries to host in Houston a week from now. Here is a resource we’re calling Pray It Up which is us asking you to pray over this event beginning Sunday, September 23 through Saturday, September 29. If you’re the praying type, please feel free to stack hands with us on this as we believe in the power of prayer. We would also ask that you pass this along to anyone else you think would like to partner with us in this way. Blessings to you and yours, and as always, thanks for being on our team. As you worship the Lord today at church be mindful of the incredible power of prayer, what God has invited you into this week as a prayer partner, and what He will do this coming weekend at Skate It Up. -Pray for consistency in your prayer life this week as you pray over Skate It Up 2018 each day. -Share the specifics of Skate It Up to your church or small group and how 100+ people will hear the Gospel of Jesus this coming Saturday. -Share this PRAY IT UP prayer guide with others through social media, texting, or email. Some incredible skate ministries and brands are coming together to make Skate It Up 2018 the best event ever. They include TruthRiders, Malchus, Extol, Redeemed, Untitled, Chasing the Wind, Battleground, Reliance, Siren, Self Destruct, CXII, CTW, Christian Skaters, 79&Lewis, and Middleman. -Pray for each ministry today by name. -Pray for their growth and health as an organization. -Pray for safety for those traveling to Houston for Skate It Up. -Pray for those bringing teenagers – that those relationships will thrive. Ministry to marginalized teenagers is hard. Resources are limited and sometimes so is encouragement. John Hocutt is the director of TruthRiders. Not only does John spearhead Skate It Up each year, he also has been faithful in weekly ministry to many skaters in Houston for a long time. -Pray for God’s blessings over John Hocutt, his family, and the TruthRiders ministry. -Pray John will be encouraged and inspired on a daily basis. -Pray for the skate park to be packed on Saturday! -Pray for circumstances like weather and people’s schedules and transportation to not get in the way. We want skaters to ride their best on Saturday, have a great time, and not get injured! -Pray for the safety of skaters at the park this weekend – those competing and those not. -Pray for Jud Heald as he prepares to share the Gospel over the microphone tomorrow. -Pray for his message to be a bold proclamation of Jesus Christ. -Pray for the Spirit to move in the open hearts of everyone who hears the Good News. We’re hoping that the skate ministries and Christ-following adults and teenagers that will be a part of Skate It Up will look past the competition component of the weekend and set their hearts on the opportunities the Lord will give them today to share their faith with those who do not know Jesus. Jud may be sharing the Gospel over the microphone, but there will be many more of us there with the same opportunity! -Pray we will be intentional in our conversations and “let our light shine before men” today as we meet people. -Pray that those at the skate park who do not know Jesus will be curious about our HOPE when they see how we speak to them and each other. -Pray we will be obedient when the Spirit moves us to share our faith in Jesus as Rescuer and Lord. -Pray we will give away every single Middleman Bible we bring to the event! This year we will award a week to Camp Woodward to one (17 or under) fortunate bowl skater. We will award additional prizes along the way. The only requirement is you have to know how to drop in to skate the bowl. Live music is scheduled from Blake Thompson aka Ziggy Moonshine during the bowl jam! Sept 30th Street Competition Sign up starts at 10 AM contest starts at 11 AM. Mark your calendar! It’s here and we are ready! It’s our third year at the largest public skate park in the USA, North Houston Skate Park. Professional skaters Brian Sumner, , Beaver Fleming, Judd Held, & Team Self Destruct are scheduled to be here to judge, and skate! The contest is FREE to enter and FREE to watch! The format will be 5 skater jam for 3 minutes per jam. There will be a finals jam for each age bracket for the top 5 skaters of each age bracket. We will break it up into age brackets and will award prizes along the way. Current plans are to have two bands play during the bowl jam! Oct 1st Street Competition Sign up starts at 10 AM contest starts at 11 AM. Mark your calendar! It’s here and we are ready! 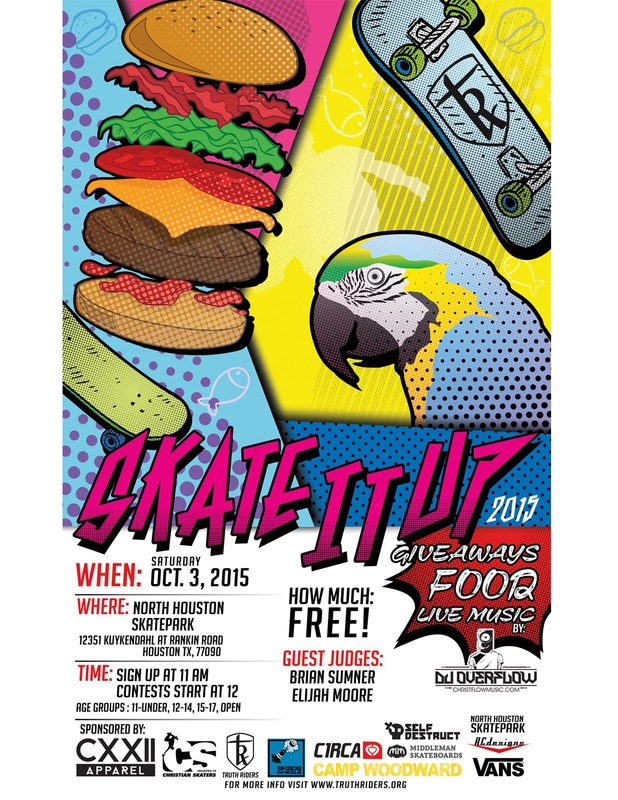 It’s our second year at the largest public skate park in the USA, North Houston Skate Park. Professional skaters Brian Sumner, Mike Steinkamp, Beaver Fleming & Team Self Destruct are scheduled to be there to judge, and skate! The contest is FREE to enter and FREE to watch! All age brackets 1st 2nd and 3rd place winner will receive a trophies. Format will be 5 skater jam for 3 minutes per jam. There will be a finals jam for each age bracket for the top 5 skater of each age bracket. The street contest we’ll be held in the area by the bacon strip. We may hold the finals for the older age brackets on the stair set. We will have fried catfish and other food while it last! Mark your calendar for October 3rd! It’s here and we are ready! This year we have been given the privilege to host the contest at the largest public skate park in the USA. 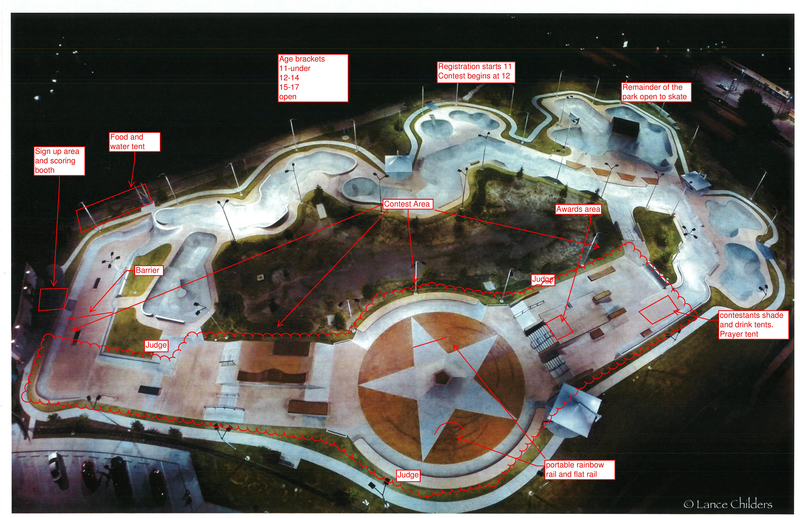 North Houston skate park or formally know as Spring skate park. Professional skaters Brian Sumner and Elijah Moore are schedule to be the guest judges along the Team Self Destruct! This year has brought a new challenge on how to format the event since the park is so big, the question is what section of the park do we use since we can’t use it all. We have decided to keep it mainly a street event with some transitions thrown in. The course will include the stair sets the plaza the bacon strip and the A-frame section. The contest is FREE to enter and FREE to watch! All age brackets 1st 2nd and 3rd place winner will receive a custom made trophies. We will be using the latest scoring software from the Boardr and the scoring will be available live during the event. Here’s the lay out of the park area. Skaters will skate in a 5 man jam sessions for 3 minutes. The top 5 skaters of each age group will compete in a final jam session. Once all the age brackets has been completed the awards will be handed out. Sign up starts at 11:00 and the contest will start at 12:00. We will have some fried catfish and jambalaya on hand for contestants and the audience alike. Come out and skate or just enjoy the park and watch the skaters. 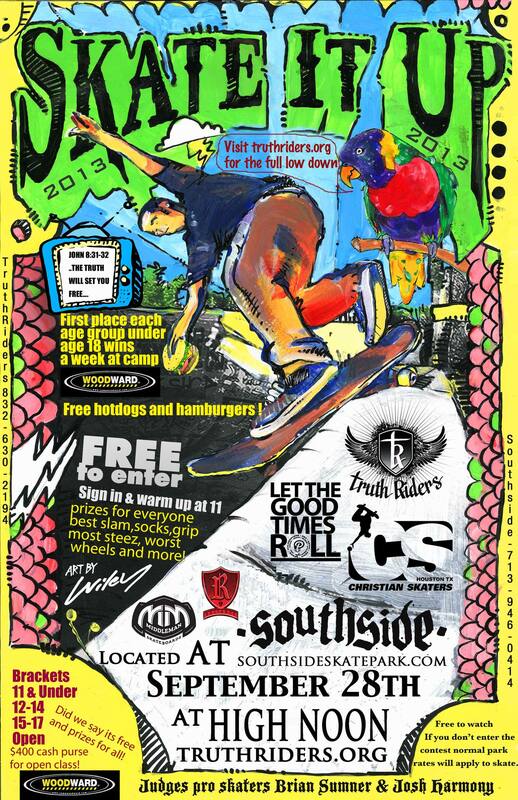 Again this year it’s all FREE and of course it’s at the best street course in Houston Southside skatepark at 510 Iowa St, South Houston, TX 77587, thanks to Big O for hosting the event. We’ve got Josh Harmony, Brian Sumner, Casey Wells and Jon “Deezle” Depoian coming to judge the event. Josh Harmony is sponsored by/skates for Toy Machine Skateboards, Rvca Clothing, Fallen Footwear, Pig Wheels, Bro Style Grip and Independent Trucks. Brian Sumner is sponsored by/skates for Reliance skateboards, Air speed footwear & Truth Soul Armor. Casey and Deezle both skate for Reliance/Siren. Our friends from SK808 wheels Aaron Estrada and Ya Bra Roo will be spinning tunes. We’ve got a week at camp Woodward for first place in each age bracket under 18 and $400 cash purse for the open class. Don’t you worry 2nd and 3rd place will pick up some sweet prize packs. Bring your friends there will be free burgers as always and prizes for things like best socks, grip design, over all steez, best trick, highest air, best slam, you name it we will give away prizes for it, all you have to do is show up. If you want to skate for free then sign up for the contest and enjoy one of our first round jams to test your skills against the best park and skaters in Htown. We know everyone can’t win the contest so we will be roaming the crowd to find the winner of a free week at camp Woodward for just being there but you must stay to the end to win! So come out and join the fun and spend the day at Southside on us. We hope to see you there, show up early sign up is at 11 and stay late……the park closes at it’s usual time….I think that’s 9pm. A big thanks to our sponsors Camp Woodward, SK808, Christian Skaters, Middleman Skateboards, Reliance Skate boards, Vans & All the families that have supported us through out. God bless from the TruthRiders…. Skate It Up -Elijahmoore.org- from EMj-CreAtioN- Elijah Moore jr on Vimeo. 2012 Skate it up was at Southside skatepark again! Thanks to Big O for hosting the contest at the best indoor/street park in Houston and surrounding area. Elijah Moore and Dog Tacos author Terry McChesney came down to Judge. We had the usual street contest and added a bowl jam of all ages! The contest again was free to enter and watch. Our friends from Sk808 brought rhymes and busted out the raps along with some sick wheels. Thanks to everyone that came out! 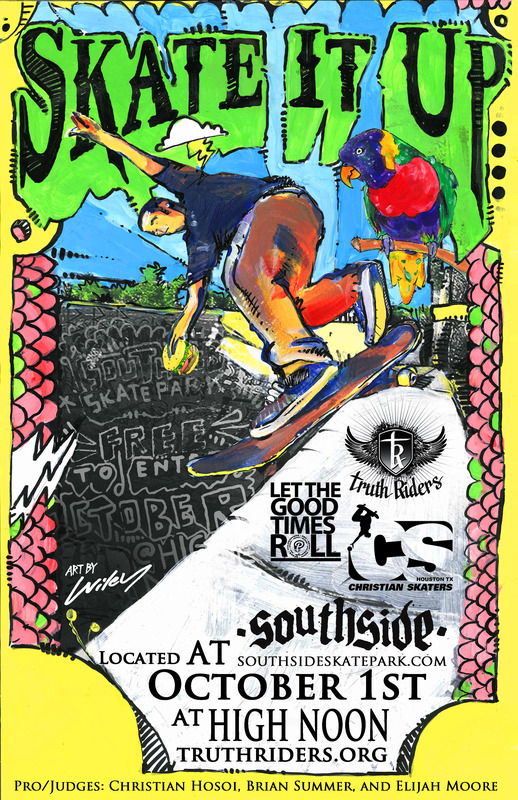 Here are a few posters from our past skate contest along with a few of our promotional videos.